The flags we've been using for photos on Football Fan Food have also helped keep us up to speed with who is still in (at full-mast/toothpick) and who has been knocked out (at half-mast). If you've been watching the World Cup and muttering about players writhing around on the floor, Geoff Foster has done the research to back up your complaints. 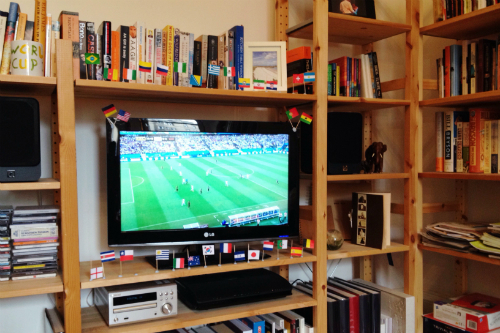 Hadley Freeman reports on how people in Brazil's favelas have been making the World Cup work for them. Marcus Honeysett considers how Christianity could challenge middle class suburbia. The boys at Sounds Good To Me Too have made a summer playlist for us all. I love the BBC and so does Alex Proud. Even more, I love John Piper's love for God, expressed in typical passion as he gives Christians twelve questions to ask before watching programmes like Game of Thrones.